So, we decided to dig in deeper! Looking at the Oakley Holeshot®, which to us sounds like a golf watch, we figured it would be our first choice for sailing. 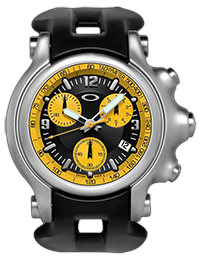 We liked the idea of the UNOBTAINIUM® rubber strap over a metal one, the little chronographs seemed like they would be really useful AND it even comes with a black and yellow face that screams, “I’m a badass sailor!” Plus, at around $600 it’s quite reasonable and not a train-wreck to give it a little rope burn. We also looked at the ELITE TIME BOMB® II. It’s somewhat simpler than the Holeshot and quite a bit more expensive at $2,750. With that carbon fiber face we thought it belonged on the wrist of Lance Armstrong or maybe an F1 driver, so we decided to pass on that one. The face of the 12 Gauge also features carbon fiber, which will make your sailboat go really fast. Other notable options are the 12 Gauge™ and Minute Machine®. These are similar to the Holeshot in their face design. They include a couple of little chronographs and a bezel with all kinds of numbers on it that looks cool but you will likely never use. The face of the 12 Gauge also features carbon fiber, which will make your sailboat go really fast. At least it’s a more discreet bit of carbon when compared to the Time Bomb II. The price on both of those is quite a bit more than our first choice, the Holeshot, although there’s an Unobtainium version of the Minute Machine that’s quite affordable at $995. We reckon some of these Oakley mens watches would make excellent sailing watches. For the younger sailors, or those who can’t afford one of the more prestigious sailing watches such as one of the Omega Seamaster series or a Tag Heuer Calibre 11, these Oakley options are perfect. Plus, we wouldn’t be surprised if some of the Tag Heuer Calibre 11 owners don’t take the watch sailing anyway. But hey, Tag Heuer calls it a sailing watch. To us a sailing watch is one that actually sails. We think we’ll turn the Oakley Holeshot into one!